Lock in a great price for Holiday Inn Express Tower Center New Brunswick – rated 8.7 by recent guests! The rooms are quiet, clean and comfortable. This is my go to place to stay when visiting New Jersey. The whirlpool in the room was amazing!! The bed was very comfortable as well. The heated pool was a nice touch. Even that I went for just 2 days for work, I had a very relaxing 2 days there. I am not sure where to start. I stayed here for 4 nights and this has to be the best Hotel in Brunswick. Right when you walk in you are greeted with a REAL smile, not like most Hotels with employees trying to be over nice (even housekeeping greeted you with a smile in the hallway). The staff here are genuinely happy to host you. The rooms are 10/10 I could not find one dirty spot or something broken, the room was immaculate and did not have that musty smell Hotels generally have. The rooms are very big with plenty of space to fit everything in. The Hotel is silent, I mean silent! You do not hear hallway noises or outside. The pool was big and clean. Workout room was nice as well. More then enough parking outside in the lot. This Hotel is a hidden gem in Brunswick. The Hotel rating should be a 5 star! Look no further, it is worth every single penny! The Hotel was so great I already booked my next trip! Staff were nice and courteous. Breakfast was good . Holiday Inn Express Tower Center New Brunswick This rating is a reflection of how the property compares to the industry standard when it comes to price, facilities and services available. It's based on a self-evaluation by the property. Use this rating to help choose your stay! Just off Interstate 95 and 2.6 miles from Rutgers University, this East Brunswick, New Jersey hotel provides an indoor pool. Guest rooms include a microwave, refrigerator and free WiFi. The Holiday Inn Express Tower Center New Brunswick includes in-room microwaves and coffee facilities. Each room is decorated in brown tones and wood furniture. A flat-screen cable TV and a CD player are also provided. A gym and a business center are available at the hotel. New Brunswick Holiday Inn Express Tower Center offers free parking. Newark Airport is 25 minutes' drive away, while the New Brunswick Train Station is 8 minutes' drive away. The hotel is located in the Tower Center Office. Six Flags Great Adventure, an amusement park, is a 40 minute drive from the hotel. This property is also rated for the best value in East Brunswick! Guests are getting more for their money when compared to other properties in this city. 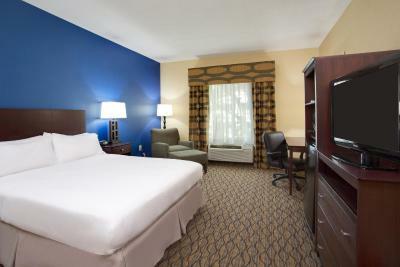 When would you like to stay at Holiday Inn Express Tower Center New Brunswick? Bed type preference cannot be guaranteed as it will be allocated upon arrival based on availability. This room has a microwave, refrigerator and flat-screen TV with cable channels. This room has 2 queen-size beds, a microwave, refrigerator and flat-screen TV with cable channels. This room includes a spa tub and a flat-screen TV with cable channels. This room is wheelchair accessible with a roll-in shower. This suite includes a sofa bed and a flat-screen TV with cable channels. This accessible room includes a flat-screen cable TV and coffee-making facilities. This suite offers a 40" HDTV, a refrigerator and a microwave. There is also a sofa bed in this room. This disability accessible room has a microwave, refrigerator and flat-screen TV with cable channels. House Rules Holiday Inn Express Tower Center New Brunswick takes special requests – add in the next step! Holiday Inn Express Tower Center New Brunswick accepts these cards and reserves the right to temporarily hold an amount prior to arrival. As my English is not perfect I asked to order for me the taxi to the airport. They refused. They gave me phone number of taxi driver and asked me to order it by myself. This is really the only problem I had. Apart from this my stay was excellent. Not much of a view. I was hoping to get an omelette not a buffet scrumble eggs. I didn’t really like the set up. Used Disposable coffee cups and toiletries were not replaced with new ones.